2016 KanJam Klassic - New champs! On Saturday, May 7th, 2016, 27 teams competed in the 2016 KanJam Klassic. In the end, Matteson Brothers won their first major title and were crowned as new Klassic champions. Full results and full video to come! For more information, go to http://www.kanjamleague.com. The KanJam Klassic is a major KanJam tournament, with the champions winning "The Hammer." This marked the 12th annual Klassic tournament and largest to date, featuring a total of 33 teams from four different states and one Canadian province. 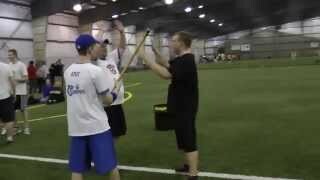 The tournament was held indoors at Sportsplex in North Tonawanda, NY on April 25th, 2015. Proceeds were donated to "Carly's Club" at Roswell Park Cancer Institute. 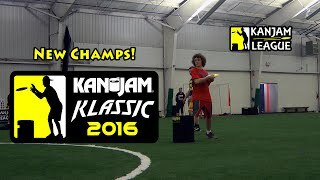 Check out http://www.kanjamleague.com/klassic/champions/2015 for full results. The KanJam Klassic is a major KanJam tournament, with the champions winning "The Hammer." This marked the 11th annual Klassic tournament, and it took place on April 19th, 2014. The tournament was held indoors at the Sahlen Sports Park in Elma, NY. After overcoming an incredible three games to none series deficit in the Semi-Finals, Stallion Survivors (Eric Klavoon & Jon Sandino) swept No Big Deal (Matt Nelson & Shane Nelson) four games to none in the Finals to be crowned 2014 KanJam Klassic Champions. Stallion Survivors posted an overall tournament record of 30-5. Proceeds were donated to "Carly's Club" at Roswell Park Cancer Institute. 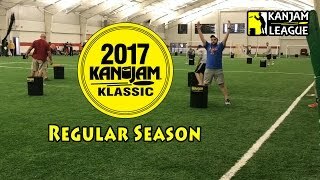 Check out http://www.kanjamleague.com/klassic/champions/2014 for full results. 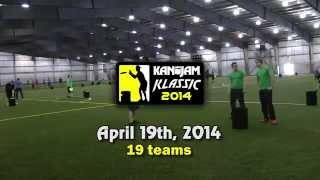 The 10th annual KanJam Klassic took place on April 21st, 2013. The tournament was held indoors at the Sahlen Sports Park in Elma, NY. 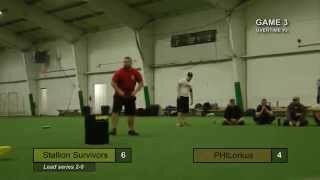 This marked the most competitive KanJam tournament of all time, featuring four playoff series that were decided in Game 7, with three of those going to overtime in the final game. PHILorkus, composed of Josh Greenauer and Phil Schneider, won for the first time as a team, posting an overall tournament record of 29-10. The Italian Stallions (Jon Sandino & Brian Ellis) were runners-up. Proceeds were donated to "Carly's Club" at Roswell Park Cancer Institute. 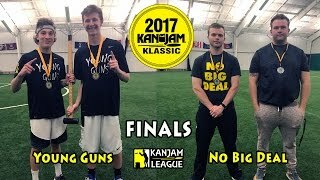 Check out www.kanjamleague.com for full results. 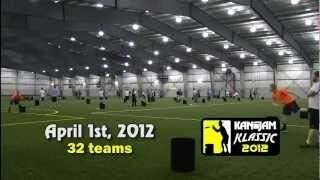 The 9th annual KanJam Klassic took place on April 1st, 2012. The tournament was held indoors at the Sahlen Sports Park in Elma, NY. Proceeds were donated to "Carly's Club" at Roswell Park Cancer Institute. Rebel Survivors, composed of Eric and Dan Klavoon, won for the third year in a row, posting an overall tournament record of 40-5. Little Lebowski Urban Achievers (Mark Stein & Jackson Trinh) were runners-up. Check out www.kanjamleague.com for full results. 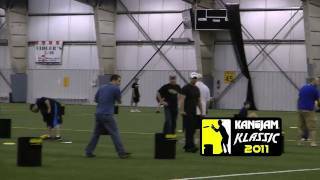 The 8th annual KanJam Klassic took place on April 16th, 2011. The tournament was held indoors at the Sahlen Sports Park in Elma, NY. Proceeds were donated to "Carly's Club" at Roswell Park Cancer Institute. Rebel Survivors, composed of Eric and Dan Klavoon, won for the second year in a row. Milo's Minions (Adam Williams & Nate Schutt) were runners-up. Check out www.kanjamleague.com for full results.